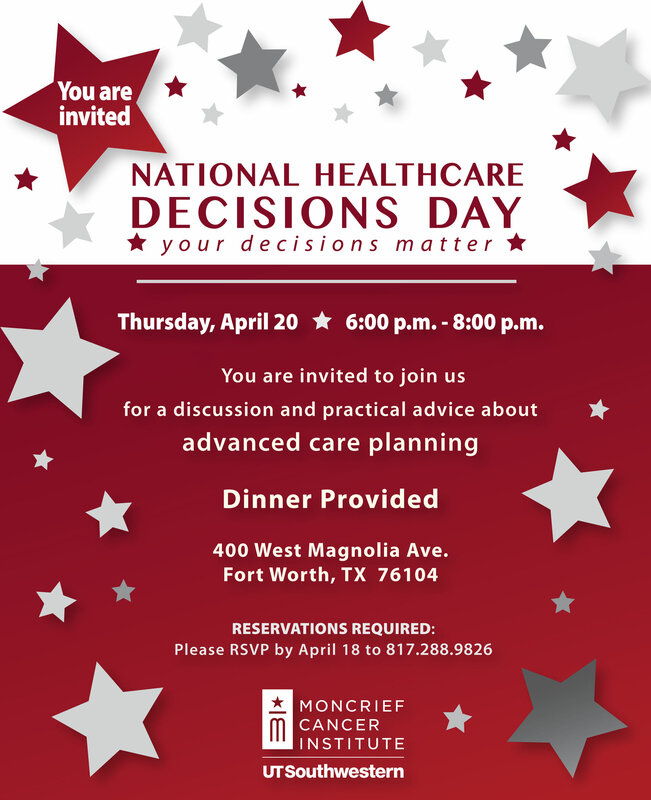 April 16-22, 2017 is National Healthcare Decisions Day week long event! Join The Coalition for Quality End-of-Life Care in leading the effort in Tarrant County to inspire, educate, and empower our community about the importance of advance healthcare planning. By signing up your organization and hosting an educational activity, program or event – no matter how large or small--you can qualify as an official participant! Find everything you need to develop your own program, including program ideas, templates and marketing materials in our ToolKit (see below). Additional resources available at the www.nhdd.org site. Registration is required for local events. For more information and registration details for the local events please contact Jaime Cobb at 817-877-1199. Here is a list of local organizations that are leading by example and providing Advance Care Planning for their staff! Confirmation of Participation: Registers you/your organization as an official participant. Complete and fax/email to be utilize ToolKit and have your program included in CQEC and NHDD website. Suggested Program Outreach Activities: Lists program ideas to consider for your organization. Slick Template – full page: Template can be edited and produced to market your program. Press Release Template: Press release template announcing your organization’s plan to participate in National Healthcare Decisions Day can be edited with your organization’s information. Lead By Example Template: Memo template to be used to announce a campaign to encourage employees of your organization to complete their own advance directives. National/Professional Organizations Email Template: Template to be used to communicate with professional organizations at different levels to participate in NHDD. Faith-based Organization Email Template: Template can be edited to communicate with area clergy/religious leaders to educate about advance care planning and opportunities to get involved in NHDD. Ask Me Sticker: A sticker logo to be used on buttons, documents, etc. Participant Feedback Form: A form to solicit feedback from participants at your event. Can be edited as necessary. Event Planning Checklist: A planning checklist outlining activities, assignments, timelines, etc. To see a complete list of organizations participating nationwide, please visit www.nhdd.org. Additional tools and information can be found on the National Healthcare Decisions Day website.